Wedding Audio Equipment Rental - Live Band or DJ? Wedding Audio Equipment Rental – Live Band or DJ? 26 Jul Wedding Audio Equipment Rental – Live Band or DJ? A wedding celebration without music would be a poor celebration indeed. For music helps to make the occasion a joyous one. Without music there is no dancing and without dancing there is no courtship and what is a wedding if not a celebration of the joy and mystery of attraction and union. But let’s keep our minds on the music here. So you’re going to rent a sound system for your wedding afters but you must decide between a live band or a DJ. Here are some of the advantages of either option to help you make up your mind and some wedding audio equipment rental info to help you. Let’s start with the advantages of hiring a band and giving some suggestions for wedding audio equipment rental. Tradition: Wedding celebrations have been accompanied by live music for hundreds of years and this tradition will no doubt continue into the foreseeable future. As long as people celebrate the union of two people, music and dancing will be indispensable. The only difference between weddings of the past and now is that these days the music and singing is amplified and put through a PA system for weddings. 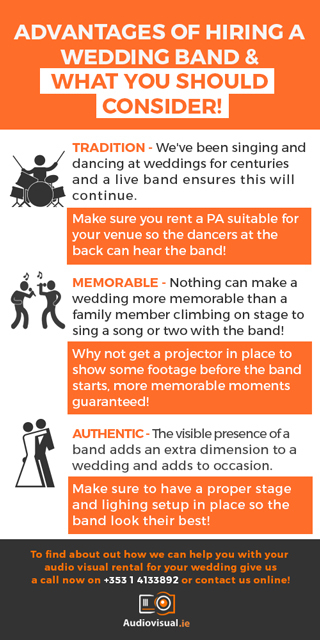 Many traditions are observed at a wedding so why not go all the way and hire a band? Memorable: Having a live band contributes to a more ‘lively’ and fun atmosphere. It makes the occasion that much more special and memorable. No wedding would be complete without the embarrassment and laughter due to a friend or family member getting up on stage and singing their favourite song or getting on the dance floor and trying to dance. This kind of fun and general felicity would be impossible without the presence of a live band. It is a vibe unique to wedding celebrations. What some others like to do for before a band is get a projector and screen rental for the wedding to start the embarrassment before the band arrives and during/after the dinner! Authentic: Having real music at your wedding celebration makes the whole experience more authentic. The music is more organic than that provided by a DJ and this, together with the visible presence of the band, lends a genuineness to the occasion. You can also hire wedding lighting to make sure the band look their best on stage – then you know you’ve been to a real wedding! Hiring a DJ for your wedding also has its advantages. Space saving and less costly. These are the most obvious advantages of hiring a DJ for a wedding. All you need is a couple of tops and bins, a couple of FX lights, a DJ mixer and, of course, a DJ and you’re sorted. Interacts with visual technology. A band will distract from visuals, whereas a DJ will work with them. Why not play a film at the wedding on a projector or flat screen, mute it, and let the DJ provide the sound track? Putting on an audio visual show will make your wedding day even more memorable. Ideal for dancing. Because it creates a vibe more like a nightclub than a live gig, having a DJ will encourage more dancing. A wedding celebration is not just about the happy couple. It is also about courtship. It’s about who will be the next happy couple. Therefore, people will want to get up and dance and a good DJ with the right sound system will provide the right music. Whether you opt for a live band or a DJ, make sure you talk to an expert who can advise you as to which sound system, stage and lighting to hire for your wedding. You want the day to be perfect so it’s essential to get the music right, whatever your choice, and picking the right technology is the first step towards that. Give us a call now on +353 1 4133892, email me directly at ivan@audiovisual.ie or contact us online to find out how we can help you with your audio visual rental for your wedding!